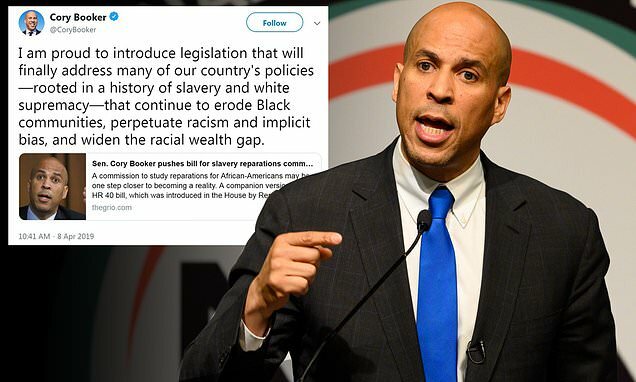 Democratic presidential contender Cory Booker introduced legislation Monday to establish a commission to study reparations for a slavery - a hot topic on the campaign trail. Cory Booker is doing important work for the people. We should all give 10 % and vote Democrat. I don’t support Booker on reparations but I definitely think his plan is less stupid than Trump’s more than 10% charity for the rich. Well it would be like you to draw Trump into the conversation. Totally predictable. Predictable, yes, but also entirely true. Trump gave a more than 10% charity gift to the rich by taxing the non-rich and by tripling your deficit. Good for him. Trump 2020!